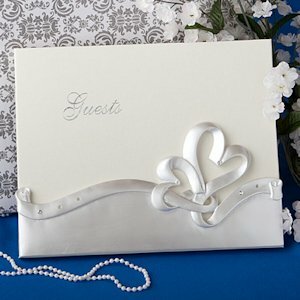 SHARE This elegant interlocking hearts guest book combines traditional beauty with modern design. The 9 7/8" by 7 7/8" book features 50 lined pages for guests to write their names, addresses and/or best wishes. Our cover design includes a shimmering silver title and white poly resin pair of hearts with a rhinestone-accented ribbon running throughout. 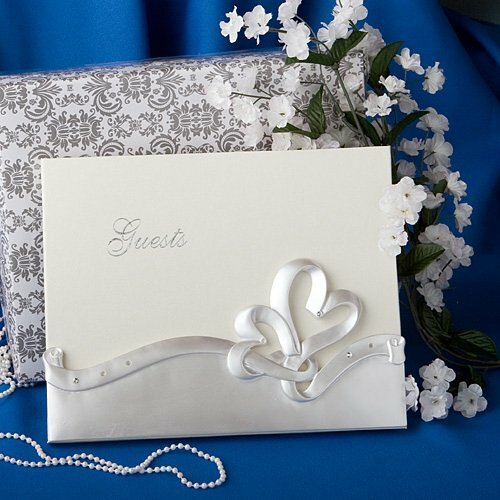 The book arrives in a white and grey damask gift box with clear acetate cover, suitable for display and/or storage.